The race for owning Mindtree has heated up. Media reports suggest that VG Siddhartha, one of the large non-promoter shareholders who along with his group companies own about 20.4 percent of Mindtree, wants to monetise his investments. The likely buyer is rival IT company L&T Infotech (LTI). Should the deal go through and it results in a change in control, a mandatory open offer, whereby LTI acquires 51 percent stake, remains a possibility. Media reports also suggest interest from private equity firms, a probable white knight at the behest of the promoters or even a buyback to appease shareholders. While it is speculative to comment on who will finally end up buying the stake of Siddhartha, the battle for Mindtree is good news for minority shareholders. 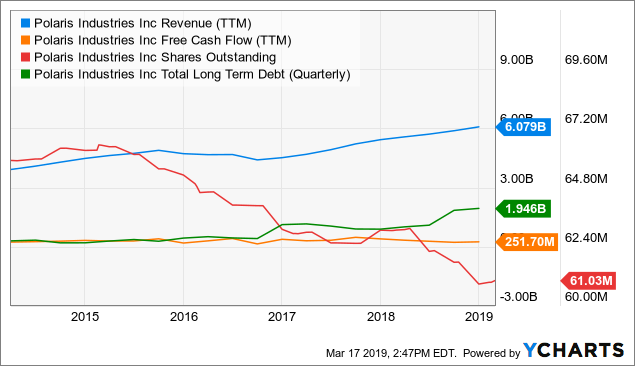 Mindtree is obviously a highly sought after company which has carved out a niche for itself in new technology areas with its early adoption of digital tech that is beginning to yield rich dividends now. The world has been closely following the success story and many (including rivals) want to be a part of this journey now. What if the buyer is LTI? 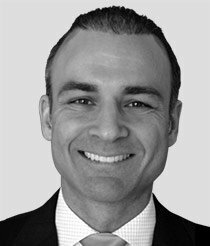 While the contours of the deal are not known, what would be critical would be the approach of the founders — whether they exit and handover complete control to the LTI management. Mindtree’s founders Krishnakumar Natarajan, NS Parthasarathy, Rostow Ravanan and Subroto Bagchi hold 3.72 percent, 1.43 percent, 0.71 percent and 3.1 percent stake, respectively, and were opposed to the idea of ceding control. At the rumoured price of Rs 981 per share, the value of Siddhartha’s stake amounts to Rs 3,288 crore. However, if there is a change in control and LTI ends up acquiring close to 51 percent of Mindtree, whereby the latter becomes a subsidiary, the cost of this acquisition might rise to Rs 8,205 crore. As on December 2018, LTI had cash and liquid investments of close to Rs 2,032.8 crore. We do not see any reason why a rival like LTI would like to remain a passive investor in Mindtree. Hence, it is not unreasonable to assume that should this deal goes through, LTI is likely to acquire a controlling stake of 51 percent. Given the balance sheet strength of LTI (net worth Rs 4387 crore), the exact nature of financing the acquisition (the vehicle through which the stake is acquired, the nature of the leverage) would largely dictate whether the acquisition is value accretive from the start for LTI shareholders. By controlling 51 percent of Mindtree, without assuming any synergistic benefits, LTI will have access to Rs 460 crore of profit in FY20. If the total interest cost that LTI has to bear is less, then the acquisition stands to be value accretive from inception. Over the medium to long term, synergistic gains will flow through. First and foremost it helps the business of LTI to scale up. 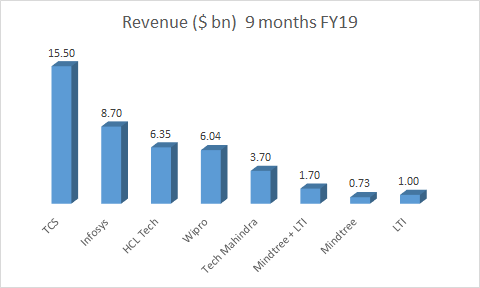 On the basis of nine month FY19 financials, the combined revenue of LTI and Mindtree would be close to $1.7 billion, the sixth largest in the industry. Their geographical presence is similar with 73.4 percent of revenue accruing from the US and 18.7 percent from Europe for Mindtree, not very different from LTI’s which earns close to 67 percent from the US and 17 percent from Europe. 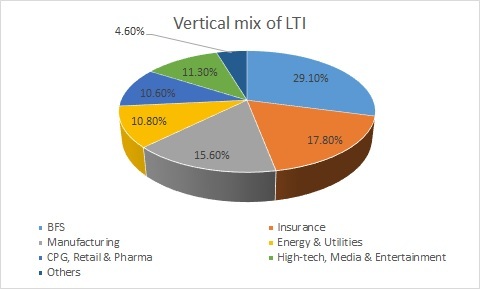 In terms of verticals, however, LTI has a lot to gain as Mindtree has a strong presence in technology, media and services (close to 40 percent) where the rate of growth of digital adoption is very high. The other verticals where Mindtree has a strong footprint are retail and consumer packaged goods (CPG) and travel and hospitality – industries that are at the forefront of digital adoption. In fact, the share of digital in total business for Mindtree is much higher at 49.5 percent compared to 37 percent for LTI. Incidentally, Mindtree’s revenue per employee (thanks to the higher value added in digital) is a tad higher than LTI. However, LTI has been reporting a much better operating margin of close to 20 percent compared to 15 percent for Mindtree. 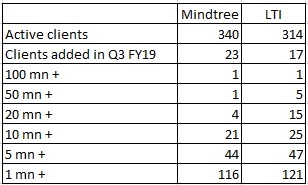 While for LTI this has come with a record high utilisation rate of 82 percent (compared to 74.6 percent for Mindtree), we feel the synergistic benefits, coupled with the sharper focus of LTI management, can lead to improvement in Mindtree’s margin performance. The client concentration matrix of both the companies is similar with close to 33 percent of revenue accruing from the top five clients. 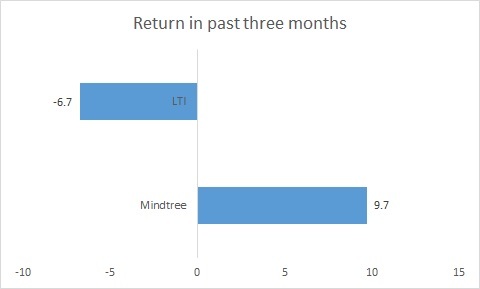 In the past three months, LTI has underperformed while Mindtree has outperformed, riding on better result and rumours of this stake transfer. Unless the contours of the transaction makes it value accretive for LTI shareholders, we expect LTI’s underperformance to continue in the near term. Investors keen on participating in this theme should do it through Mindtree. We are not very upbeat about the probability of buyback thwarting a hostile takeover as the quantum of such buyback would be very limited.